Well I can’t really explain it, that’s the problem. Funny story. See, I dropped it yesterday and cracked the screen which I guess I could live with, but now the battery’s also doing this thing where it goes from 65 percent to below 10 immediately and shuts off randomly and I didn’t want to rule out terrorism. So I was thinking while you’re in there you’ll just fix the thing, I mean it’s gotta be working to get that possible terrorism off it, right? So can you send a guy over to fix that, or is there an office nearby I can swing by? 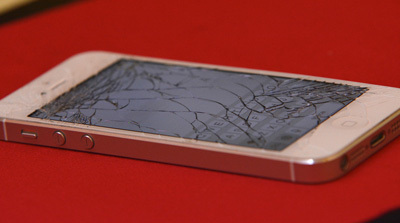 Well, I know it SOUNDS like I just need to get it repaired but the Genius Bar wants like 150 bucks to fix this thing. It’s not under warranty anymore. And there’s no appointments until Thursday. No, I don’t know for SURE if there’s terrorist stuff in my phone. I know I love America, that’s why I’m asking you to fix it. Do the terrorist check. Look, dammit, hack my phone. Oh, oh. Oh, yes. Yes, I am ACUTELY AWARE at the moment that it is “not the government’s job to fix things.” Am I RIGHT, people? What? No, no one. It’s just me here. You know, I’m assuming that you guys would just WANT to fix it for me. I feel like I’m being a MODEL CITIZEN for calling you guys. I am actively aware of the threat of terrorism on my phone, and I am trying to be pro-active about—what? I don’t know. Phone terrorism. What’s it… whaddaya… CYBER TERRORISM. That’s it. There could be cyber terrorists on my phone. Yes. Sure I know how that works. Yes. NCIS. All thirteen seasons, yes. Well, Abby, DUH. Look, I think we’re getting off track here. We cannot be too careful in this day and age. I have to say this is really disappointing to hear that you’re not interested in helping me here. In theory, I pay my taxes and vote. All I’m saying here is, I’m VERY concerned about protecting our country. And as an upstanding citizen, I am WILLING to let you look at my phone, or ideally offer a free replacement of a current or newer model, in order to access it and fix the screen and maybe see if it’s got terrorism on it. I can bring it in Wednesday? Baller! Okay, one other thing: do you sell cases? This entry was posted in Essays and tagged Government, Hacking, iPhone by August J. Pollak. Bookmark the permalink.